The day was dominated by almost constant very thick fog which severely limited observation. A single Firecrest was seen near the Britannia and two Great Spotted Woodpeckers, a Blackcap, six Chiffchaffs and a Wheatear were also seen. Seawatching was impossible but a check of the Patch produced a Common Tern and one of the Iceland Gulls and a second-winter Yellow-legged Gull were seen at the fishing boats. 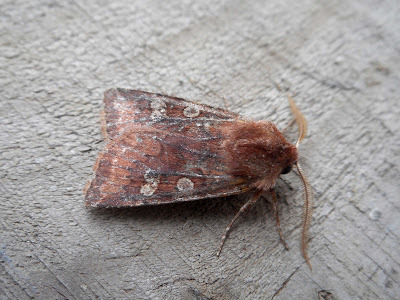 Moths at the Observatory have been fairly limited but elsewhere a couple of White-marked have been trapped, the second and third Dungeness area records.